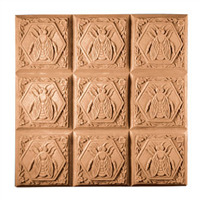 Good luck getting to the honeycomb with all these bees on the Beehive Soap Mold Tray. Note there are no score lines on this mold, allowing you to size your soaps to personal preference. Bar Depth: 1.25" Bar Length: 3.375"
Melt & Pour Soap: Pour melted soap at a temperature no hotter than 135ºF into mold. Cool until soap has hardened. Remove soap from mold, and slice into bars. For easier unmolding, place into freezer for 30 minutes, and then immerse bottom of the mold in hot water for a few moments. Do not use cooking spray to coat mold. Cold Process Soap: Coat the mold with cooking spray. Pour soap at trace into mold. After 24 hours, flip mold over onto a clean surface. Gently push the back of the mold until the soap begins to release then pull the soap out of the mold with a gloved hand. Slice into bars. Allow soap to cure for 4-8 weeks. Note that some cp soap recipes may require a week to harden enough to remove from the mold. If this is the case with your recipe, we recommend adding sodium lactate to your recipe to assist with creating a harder bar faster. Lotion Bars: Pour melted lotion bar mixture into mold at a temperature no hotter than 135ºF. Allow mixture to solidify. Flip mold over onto clean surface. Gently push back of mold until lotion bar begins to release then pull bar out of mold. Slice into lotion bars. COMMENTS: Makes beautiful and large bars of soap. Very detailed. I tried using it for bath fizzies too. It worked! My nieces had a blast making their own creations. COMMENTS: I fell in love with this mold the first time I saw it! I use a honey glycerin soap base (of course! )and I add wild orange essential oil as well. When the soap is in molded the detail is amazing! it looks like the bees are actually moving and buzzing. I have also added gold mica to the top layer and painted the bees' stripes black to bring more dimension. You will not be disappointed with this mold. • Love the detail! So life-like. "One of my favorite molds!" COMMENTS: This has been a huge hit with my customers. The design is cute, but not over the top. I really like that I can decide what size to make the bars, since there is no scoring. It is also probably the easiest non-silicone mold I have to un-mold, which is nice. COMMENTS: Cute design, easy to unmold. I just wish that it had some sort of guide to cut, but overall it's a cute mold. 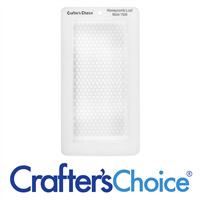 COMMENTS: I love this mold - it is easy to use, I can cut my own sizes and it looks great every time! COMMENTS: I love this mold! I use it to make a honey-scented soap that everyone loves. Very accurate, clean mold. Use it with MP with no problems, releases very nicely. 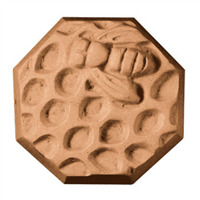 COMMENTS: This is a great mold for bee themed products. The little bees are really very cute and the mold is durable. This creates LARGE bars of soap. "What are the dimensions of this soap mold?" 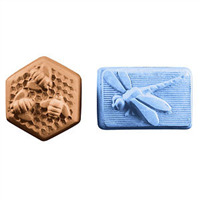 Staff Answer The dimensions are 6 5/8" x 6 5/8" x 1 1/4"
"what is the best way to get soap out of this mold without breaking off the bees?" You can run warm water over the bottom (bee side) of the mold.